I found myself in one of the trendier parts on London on friday night to check out the first London club night thrown by Hijacker Records, whose roster crammed into a packed (and I mean wall-to-wall rammed), sweaty basement club to flex the label's range of electronic acts and recent releases. 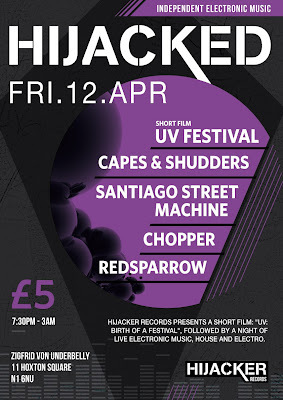 Not your average club night, things started with a screening of a short film about the festival the label hosted last year (which is also going on this year - more info here) and the video for recent Santiago Street Machine release, Holes. Deep house duo (with live drums, bonus) Capes and Shudders kicked the live bill off, followed by the energetic (and sweaty) Santiago Street Machine. Party electro, house, and hip hop thrown out by Chopper and RedSparrow carried the rest of the night, dropping some huuuuuuuge beats, drops and bass for the up-all-night crew. One of Choppers cuts was his recently released double A-side which is out now. Enough waffle, this needs a conclusion: If you want something done right do it yourself. What seems to be essentially a group of musicians who want to do gigs, festivals and release records got together and sorted out the whole shebang. DIY music take note.